This Fall Winter 2015-2016, a long or wrap coat, is the preferred piece of your wardrobe, having the opportunity to choose the style that best suits your personality. Lines are sober and colors neutral, as various shades of white and gray. Are used in total looks or combined with colors equally neutrals. Fashion accessories must be flashy. To break the monotony, bet on bags, boots or costume jewelry, with a special and different touch. Range from double breasted, passing by faux fur coats, to tweed coats with fur collars and just with one button. These coats are used with vintage style pieces – flare pants, boho dresse, mid heel shoes, ie, mixture of current with vintage pieces. Long classic coats, come refreshed by new colors, such as pale pink, pale yellow and baby blue, all younger colors and lengths above the knee and very easy to coordinate, because they give a light and fresh aura to the look. Also the existing and traditional iconic beige, is included in this category. Beige and pale pink tones, can be combined with other pale pink and beige tones. The baby blue and pale yellow tones can be combined with white and jeans. Best classic combinations, are made with polos and tie blouses with pants, combined with the respective fashion accessories, bags, boots and classic shoes. In this practical style, it is essential to have a suede coat, to combine with boho looks or A-line skirts and high heel boots. 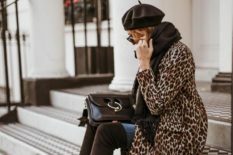 You can also invest in a parka, that coordinate with wide pants and men’s shoes, or culottes pants (cropped) and high heel shoes, or even with jeans, coordinated with sneakers, for a more casual style.